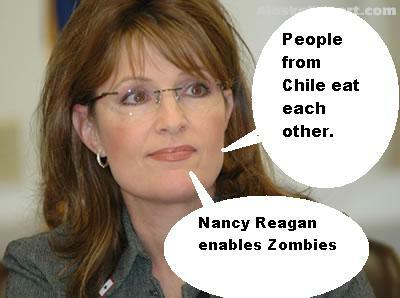 Sarah Palin mouths off about Chileans, Nancy Reagan, Snooki and Zsa Zsa Gabor. Home → Damien Zone → Sarah Palin mouths off about Chileans, Nancy Reagan, Snooki and Zsa Zsa Gabor. This video cartoon has been written directed and produced by TheDamienZone.com All rights reserved 2010. The Damien Zone predicted that Chilean cannibalism was a possibility weeks ago. Angela Merkel, in bid for U.S support, vows to rip off Chuck Norris's toupee."